In just a few short weeks summer will be over and school will be back in session. That means our lazy mornings at the campground are over and we will be looking for ways to make that “Back to School” morning routine as easy and fast as possible! The “Hair Food Feed You Hair Renew Shampoo” has a refreshing scent that will help perk you up in the morning and get your ready to start the day! 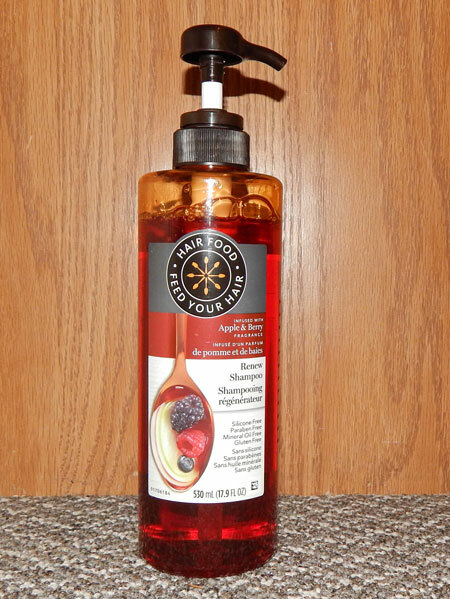 “Hair Food Feed You Hair Renew Shampoo” is a delicious apple scented shampoo that cleans and hydrates my hair. The apple scent doesn’t linger long after my hair drys. The bottle has a pump for easy dispensing of the shampoo. A little of this shampoo goes a long way. A half pump is suitable for my chin length hair. The pump prevents too much shampoo from coming out and making a mess. The shampoo has a rich lather. After using this shampoo my hair feels smoother and soft, like it does after I leave the hair salon. I like how the bottle is clear so that I know exactly how much shampoo I have left. I was unable to locate it this product on the Skin Deep Cosmetics Database, a site recommended to me by our Naturopath to learn more about the ingredients in the products I am using. I searched some of the ingredients and discovered that some are rated 7 on their list which means that those ingredients are high hazard according to their database. Parfum rated an 8, which rates as a high hazard. Parfum can be any fragrance mix, so without knowing the exact formula it may or may not be a true hazard. Be sure to research the ingredients to ensure that you are comfortable using this product. Although I have concerns over some of the ingredients, I do like how this shampoo works on my hair. I’m not sure I will continue using it until I have done more research on the ingredients. The “Hair Food Feed You Hair Renew Shampoo” is a wonderful smelling shampoo that makes your hair feel and look like you have just visited your favourite salon. *Disclosure: I received a complimentary bottle of “Hair Food Feed You Hair Renew Shampoo” through the Amazon Vine Program in exchange for my review. All opinions are 100% my own.